I’ve spent a few wonderful afternoons with Eckhart Tolle brainstorming on ideas for his new Eckhart Tolle Editions imprint. His scope of reading is vast; he never ceases to amaze me with the range of his knowledge, from ancient Greek texts to the Bible to Christian mysticism to Buddhism to a wide variety of very different modern writers and philosophers and teachers. Eckhart said he’s always looking for and finding things about “the present moment, and about awareness, spirituality, and awakening”; when he came up with those words, I saw that Eckhart was finding in a great many different sources the very things he has understood and mastered in his life. The first book he brought to us for his imprint was The Calm Center: Reflections and Meditations for Spiritual Awakening by Steve Taylor. Eckhart said he loved Steve’s short pieces because they were capable of bringing us into the present moment, into awareness, into presence. We read them and saw right away why Eckhart wants to spread Steve Taylor’s work wider in the world: the words can take us back into our calm center — which is a wonderful gift for all of us. The following is from the book’s introduction, in which Eckhart shares his personal perspective on The Calm Center and the impact Steve’s reflections can have on our lives. How religious you are depends on the nature and strength of your beliefs and how deeply you are self-identified with them. How spiritual you are depends on your degree of presence in everyday life, which is to say your state of consciousness. The essence of all spirituality is presence, a state of consciousness that transcends thinking. There is a space behind and in between your thoughts and emotions. When you become aware of that space, you are present, and you realize that your personal history, which consists of thought, is not your true identity and is not the essence of who you are. What is that space, that inner spaciousness? It is stillness, the calm center. It is pure consciousness, the transcendent I AM that becomes aware of itself. The Buddha called it sunyata, emptiness. It is the “kingdom of heaven” that Jesus pointed to, which is within you, here and now. As presence increasingly arises within you, it manifests in many different ways: inner peace, empathy, an outflow of goodwill toward your fellow human beings, creativity, a heightened sense of aliveness, freedom from dysfunctional and compulsive thinking, a deep appreciation of the present moment. All these shifts and many other changes greatly enhance the quality of your life. Presence can also empower and inspire the spoken and written word. All true spiritual teachings use words as pointers toward that transcendent dimension of consciousness that is presence. In some mysterious way, the words that arise out of presence are imbued with a certain power that goes beyond their informational value and is reflective of presence. That power can awaken or deepen the presence in those people who listen to or read those words. All true spiritual books have that power. You can, and indeed will want to, return to and reread them many times, because a certain shift in consciousness happens within you as you read. You enter the state of presence. 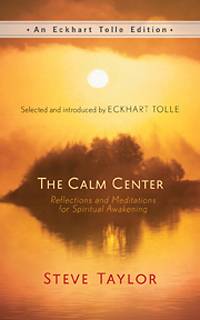 The Calm Center is one of those rare books. It belongs to the genre of poetry, which has been recognized since ancient times as a highly appropriate medium for the expression and transmission of spiritual truth. Many ancient scriptures can be considered either as poetry or as existing on the borderline between poetry and prose. The Upanishads, the Bhagavad Gita, the Dhammapada, and the Tao Te Ching are all poetic in nature. In these texts, meaning, images, sound, and rhythm interact to create a harmonious whole whose transformative power is activated in the consciousness of the reader or listener. Then there are the great mystical poets of Sufism, such as Hafiz, Rumi, Kabir, and Attar; and the Buddhist poets Basho and Milarepa. In the Christian tradition also there are great mystical poets, such as St. John of the Cross, Angelus Silesius, and of course Meister Eckhart, whose writings, with their masterful use of images and metaphors, could be described as poetic prose. In more recent times, the spiritual dimension is present in the works of numerous poets, such as Wordsworth, Whitman, Rilke, and many others. Steve Taylor’s The Calm Center is a contemporary incarnation of that ancient tradition of poetic spiritual discourse. The ultimate subject matter of almost each one of these poems is the reader’s state of consciousness. If you open yourself to their transformative power, and read slowly and attentively, then you will find that each piece will work its magic within you and bring about a subtle but distinct shift in your state of consciousness. It will free you from the mental noise of compulsive thinking and raise you into the alert inner stillness that is presence. It will awaken you to the spiritual dimension. And if you enjoy reading these poems repeatedly, their cumulative effect will be potentially life-changing. I recommend that you keep a copy of the book on your bedside table and another at your place of work to provide spiritual sustenance during your breaks, however short. The reading of each piece can become a mini-meditation, and often one will be all you need at any given time. I have read some of Steve Taylor’s poems out loud to the participants at spiritual retreats, where they were enthusiastically received. I would advise that you also occasionally share your favorite pieces aloud with your partner, spouse, family members, or group of friends. You, as well as those who listen, will benefit greatly from this, as will the quality of your relationship. Eckhart Tolle is the author of the New York Times bestsellers The Power of Now and A New Earth, which are widely regarded as two of the most influential spiritual books of our time. Visit him online at www.eckharttolletv.com. Excerpted from The Calm Center. Copyright © 2015 by Steve Taylor. Reprinted by permission from New World Library.